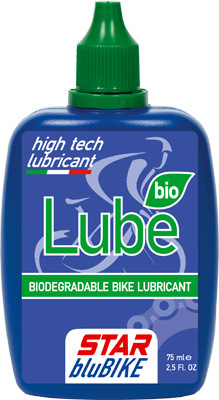 Bike biodegradable lubricant oil Bio Lube is a natural lubricant, over 95% biodegradable, studied specifically to lubricate and protect chains and any other part of your bicycle. BIO LUBE will not harm the environment and protects metal parts from rust and wear in all weather conditions. This chain lubricant is for the cyclist that loves nature and excursions in parks and reserves ecologically protected. Apply the product to clean, dry chain while turning the pedals. Avoid contact with brakes.